Ruling Words: Perspectives in Law and Literature is a collection of academic papers written by international scholars. 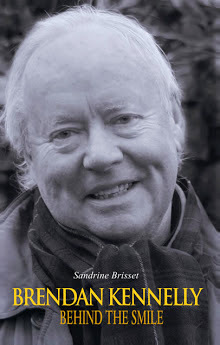 The biography of Brendan Kennelly, Brendan Kennelly: Behind the Smile by Sandrine Brisset explores both the life and the work of Ireland’s best-loved poet. Written with his full support and in close collaboration with the author, the book was authorised by him prior to publication. He recited poetry and praised Dr Brisset during the well-received launch of the book at the Shelbourne Hotel in Dublin. Since the 1960s, readers of poetry, television viewers and radio listeners have developed a special relationship with Brendan Kennelly, the mercurial poet, broadcaster and Trinity College Dublin professor. He became the jovial, roguish and charming Kerry poet that the public knows so well. This mask conquered many Irish hearts and Kennelly assumed the role of the nation’s poet confessor. But despite the warmth and affection he enjoys, there is a dark side to Kennelly. This gripping account of Brendan Kennelly's life and work takes the reader on a journey from public comedy to private tragedy. Written by a French scholar, BRENDAN KENNELLY: BEHIND THE SMILE offers readers the critical perspective of an outsider who has become an insider. comes from Brittany, in the West of France, and has been living in Dublin for over a decade. She has lectured in the Law School at Trinity College, Dublin and in the English Department at Saint Patrick’s College, Drumcondra. During that time, she has enjoyed daily contact with Brendan Kennelly and has become a colleague, a neighbour, and most of all a close friend. Her critical understanding and personal insight prompted Kennelly to say: ‘I feel she knows more about me than I do about myself.’ Behind the Smilefulfils his wish that she should write a book about his private self. Kennelly became ‘the people’s poet’ by assuming the features typical of an Irish bard. Establishing a caricature of himself, he became the jovial, alcoholic, rguish, promiscuous and charming Kerry poet. He combined the virtue of giving up his addiction to alcohol with the venality of advertisingToyota cars as a non-driver. He played on this public image to conquer many Irish hearts and become the nation’s darling poet. This book questions the caricature and demonstrates that a more complex phenomenon lies behind the apparent simplicity of both the man and his work. With Kennelly, comedy remains connected to tragedy. Close examination reveals how the cheerful rogue is also a tragic figure. This Brendan too embarked on an experimental voyage and, chameleon-like, the poet played at accentuating different facets of his personality. This was nonetheless a dangerous experiment. The public mask that Kennelly used to serve his public led to success, but also to profound loneliness. Brendan Kennelly remembers a man from Ballylongford who became known as 'The Crusher', for once upon a time he sat on a poor cat, who didn't survive the crush.